Mr Ai said he could not speak to the media about his case. Governments and activists have given a guarded welcome to the release of Chinese artist Ai Weiwei after more than two months in detention. A US state department spokesman said everyone held in China for "exercising their human rights" should be freed. British artist Anish Kapoor said he was thrilled but urged supporters to "carry on making a noise". Chinese state media said Mr Ai was bailed on Wednesday after pleading guilty to charges of tax evasion. His arrest in April had prompted a global campaign for his release. The 54-year-old told the BBC by phone earlier that he was back home and in good health. "I am already home, released on bail, I can't talk to media but I am well, thanks for all the media attention," he said. Mr Ai, who is an outspoken critic of the government, was detained as he boarded a Beijing flight bound for Hong Kong. Most famous for helping design the Bird's Nest stadium that became the centre-piece for Beijing's 2008 Olympics, he had been held at a secret location without access to a lawyer. Beijing alleged the artist had evaded taxes and destroyed evidence; his supporters said the charges were motivated by his activism. Rights groups have accused China of breaking its own laws by holding Mr Ai in secret without access to a lawyer. US state department spokesman Mark C Toner welcomed the release, saying Mr Ai had been in prison "only for exercising his internationally recognised human rights". "But there's obviously more individuals who are being held, so we want to see - and urge - a release of all these people." EU foreign policy chief Baroness Ashton said Mr Ai's case had been "the subject of widespread concern" and featured in recent EU-Chinese discussions on human rights in Beijing. She said she welcomed the news "while regretting the circumstances of his detention". In a statement, German Chancellor Angela Merkel said his release "can only be a first step" and that China must now fully explain to Mr Ai the accusations against him. His release coincides with Chinese Premier Wen Jiabao's visit this week to Germany and the UK, two countries with which Mr Ai has strong professional ties and public support. The German director of Human Rights Watch said it was "not by accident" that Mr Ai had been released shortly before Mr Wen's European visit, but warned he could now be facing further restriction on his movements. Rights group Amnesty International said Mr Ai's long detention without charge had violated China's own legal process. "It is vital that the international outcry over Ai Weiwei be extended to those activists still languishing in secret detention or charged with inciting subversion," said Amnesty's Catherine Baber. British artist Anish Kapoor told the Times newspaper that people around the world must campaign to ensure Mr Ai remains free. "We have to carry on making a noise. 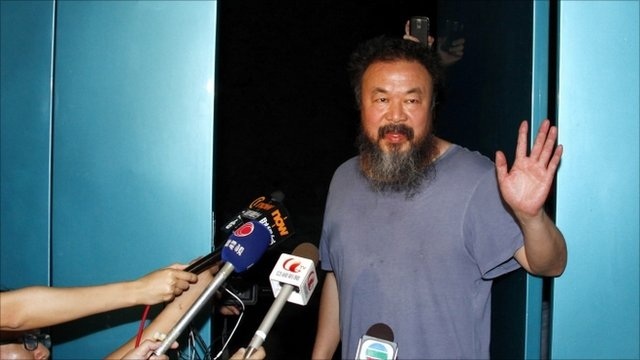 We must be strident: I call on every artist not to show in China," he said. Ai Weiwei gained international recognition in the early 1980s for his monolithic brick sculptures. Last October, he unveiled a carpet of 100 million porcelain sunflower seeds at London's Tate Modern, which he said questioned the role of an individual in society.